If your kids HATE math, you are not alone. 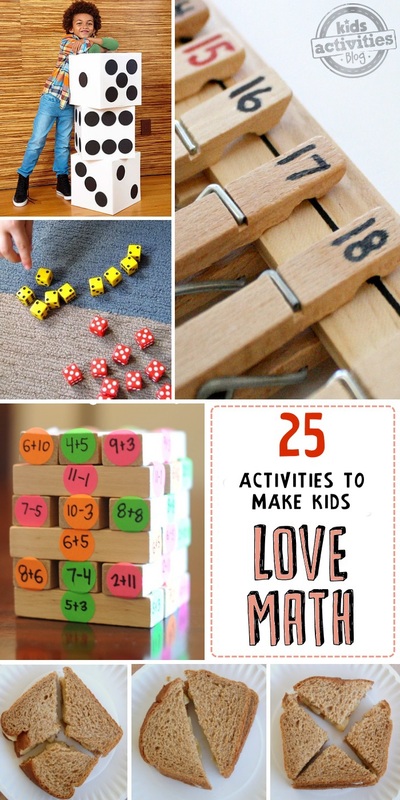 Here are some math activities for kids to help them learn to love math one problem at a time. If you do one of these activities every afternoon with your child they will not only catch up to their peers and become more confident learners, they just might also discover a love of logic! Why use math worksheets when you can use game cards to review math skills! Check out how this mom plays and learns using Uno. Skip counting is one of the pre-requisites for a solid foundation in math. Help your kids understand patterns in numbers with this skip counting activity. Do your kids LOVE games? Ours do! Practice and review fractions with the game Connect 4. 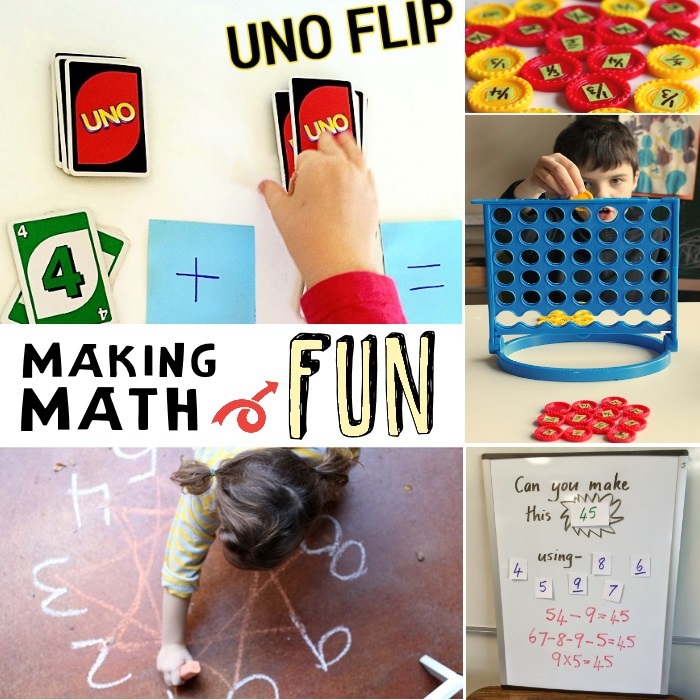 Have a Math white board – I love this idea for a class opening activity! Kids race to see how many ways they can combine numbers to make the answer. It is great for multiple levels of learning. 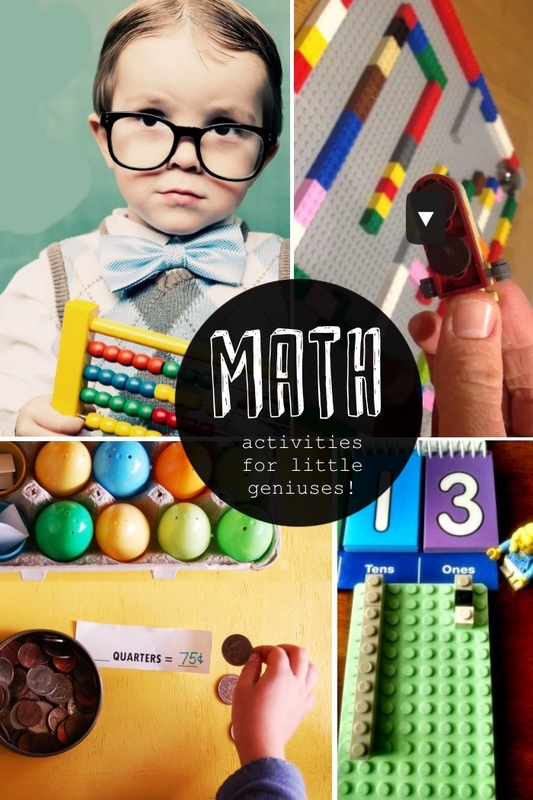 Your kids can learn while they play, on the ipad or android device with some of these Math Apps for Kids. Watch your legos move – while exploring concepts of spatial reasoning with a Lego Maze. Money math – so easy to create a math money review lesson. All you need is a random handful of coins, a slip of paper with a total your kids need to reach and a jar of change. Over at The Science Kiddo, they used legos and toys to help explain the concepts of place value. You can literally see in 3D how multiplication and powers work and grow rapidly with 3D graphing. Use Legos! Got a kiddo who struggles with corners versus verticals? They will understand quickly the importance of corners when they are made of marshmallows! Edible geometry! Play a math game with your whole body – great interaction for antsy kiddos! Play Human Place Value. Is skip counting “just a concept” to your kids? Help them see how multiplication works by skip counting with manipulatives. Trick to multiply the nines. Find the answer by folding down different fingers. Skip Counting puzzles – a great way to learn about the hundreds chart and number families/patterns. Make a math journal more interactive by adding Pop-up bar graphs. Kids remember things they create. Adaptable Worksheet with number cards. Laminate it and change the number out at the top to make a new problem! 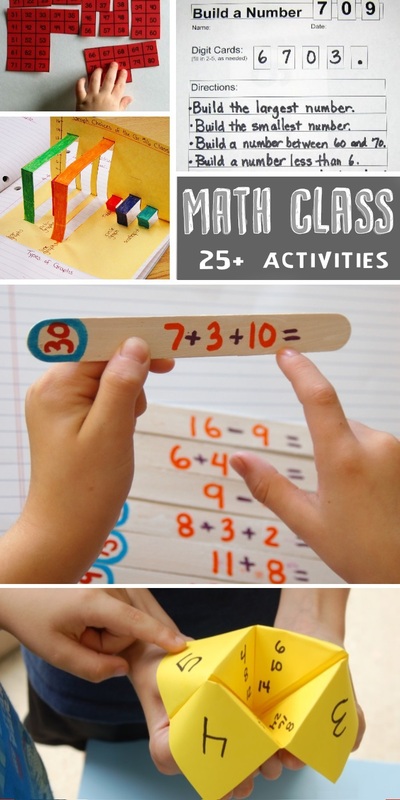 Craft Stick Math Station idea. It’s a puzzle. Each stick matches another. Make a chain from the problems. Review math facts with a cootie catcher. Great game for learning multiplication facts or even matching fractions and checking your work. 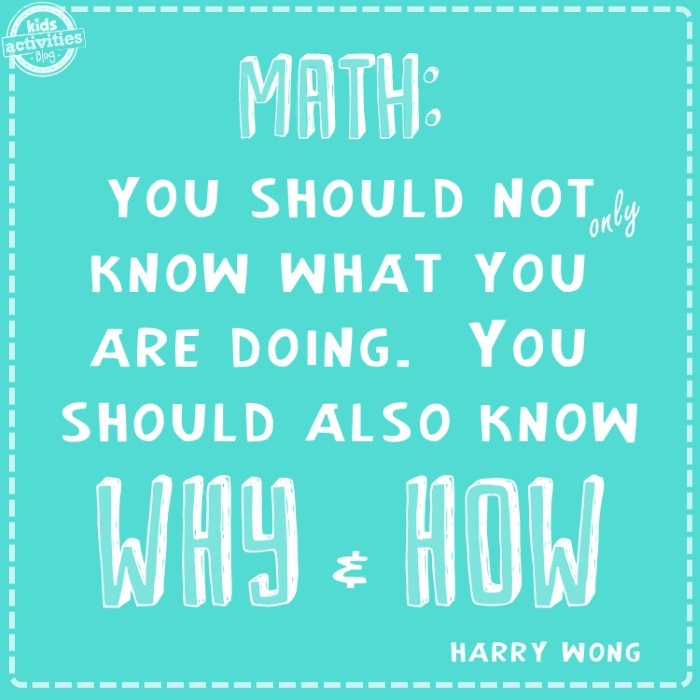 Help Kids Learn… when they don’t want to! Sandwich Fractions. Cut up your lunch and learn about fractions and amounts at the same time! Tenzi the Math Dice Game. This dice game is addictive! You can adapt it for a wide range of kids learning levels. Go big. Create a dice from a large cube box. Dice can be used in so many learning activities. Jenga – this block game is super adaptable. Use it for Speed Math Review. Make paper hands for counting. Got a kiddo who needs just a little extra help understanding the concept of twenty or numbers after ten? Try these. Have a number of the day – this is great for homeschooling families with multiple age groups and also for classroom bell openers. Site Math Words. Make word problems easier for your kids to solve with word cards for them to memorize the common words. Pre-math skills – Symmetry. It is a great way to develop spatial awareness. You make one half and your child makes the other half. Play the game Gridlock to help your kids learn graphing principles. They will literally be able to see the graphs and the lines. Number lines are a great way for kids to see the order that numbers occur. You can make your own number line. Remove clothespins and ask your kids what the missing number is. Skip counting songs! It is our kids favorite way to learn their times tables. Here are the BEST math songs.